From Thursday 20 December 2018 until Monday 20 December 2038: Enjoy 10 % off! The Soho Barcelona hotel is a perfect portrait of design and architecture.With its incomparable innovation and style, the Soho Barcelona hotel becomes the ideal place to enjoy a perfect stay in Barcelona. It has 51 elegant rooms with a design that recreates the architectural drawing of the building and matches simplicity with modernity. The terrace houses a swimming pool and offers a spectacular panoramic view over the city. 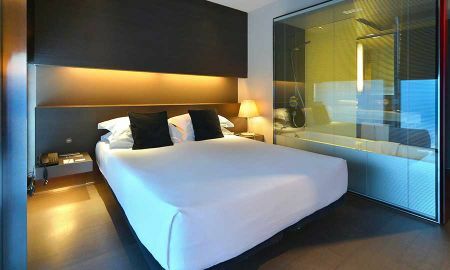 Free wireless Internet connection and Media Center are available in the Soho Barcelona hotel. The Soho Barcelona hotel boasts an outstanding location in the heart of the Eixample district. It is 10 minutes far from Plaza de Cataluña and from La Rambla street. Hotel Soho reserves the right to pre-authorize your card prior to arrival. A deposit of the first night of stay will be charged for reservations that exceed a total amount of more than 600 Euros, 7 night stay or 5 rooms. This deposit can be refund if the reservation is cancelled at least 3 days before arrival.